Kizashi translates as ‘a sign of great things to come’ in Japanese – an apt title for Suzuki’s new flagship passenger car. The upscale saloon, with switchable 2/4 wheel drive, combines the sporty energy of Suzuki’s motorcycle heritage and a touch of elegance, without abandoning Suzuki’s trademark content and value. The Kizashi benefits from the Suzuki engineers’ extensive experience creating compact cars. It’s one of the most compact cars in its class, and yet through minimizing wasted space, it has a surprisingly spacious interior. Five people are comfortably accommodated inside, with plenty of room for back-seat passengers. The boot’s roomy 461 litre capacity is easily extended by folding down one or more of the rear seats. Long journeys are made considerably more pleasant by seats ergonomically designed to support a natural posture. The Suzuki Kizashi’s 2.4 litre four cylinder engine is an upgraded version of the one that first appeared in the award winning Suzuki Grand Vitara. Not only is the Kizashi’s engine more powerful, it’s also significantly quieter owing to a variety of new noise suppressing technologies. A gallon of petrol will take you 34 miles in the Suzuki Kizashi, while CO2 emissions stand at 191 g/km. The Sport model is immediately distinguished by its more muscular appearance, including a tough, chrome-accented front fascia and low grille. The body sills are extended, while the side mouldings are lowered and, again, accented with chrome. Its sporty look and performance is highlighted by the 18 inch alloy wheels and special sport-style steering wheel. Suzuki’s determination to upgrade their brand is evident in the generous as-standard specifications. These include leather upholstery, electric, heated front seats, an electric sunroof, cruise control and an eight speaker audio system that can be hooked up to Bluetooth and mp3 players. In the UK, the Suzuki Kizashi comes with intelligent all-wheel drive (i-AWD) as standard, a performance feature more typically associated with luxury cars. The switchable 2/4 wheel drive system gives drivers a choice of the best option for their driving conditions. This enables the Suzuki Kizashi to give optimum performance and fuel economy whether or not the journey takes place in town or country and during fair weather or foul. Well, almost. The Suzuki Kizashi’s brakes are supplied by the same company that provide the braking system for the Japanese transport icon. The seven airbags, including one for the driver’s knees, and Electronic Stability Programme, are all Suzuki’s though. 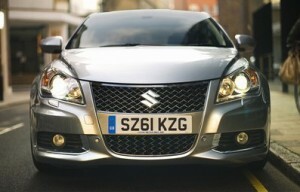 The Suzuki Kizashi will be available to buy in the UK from January 2012, with prices starting at £21,995.